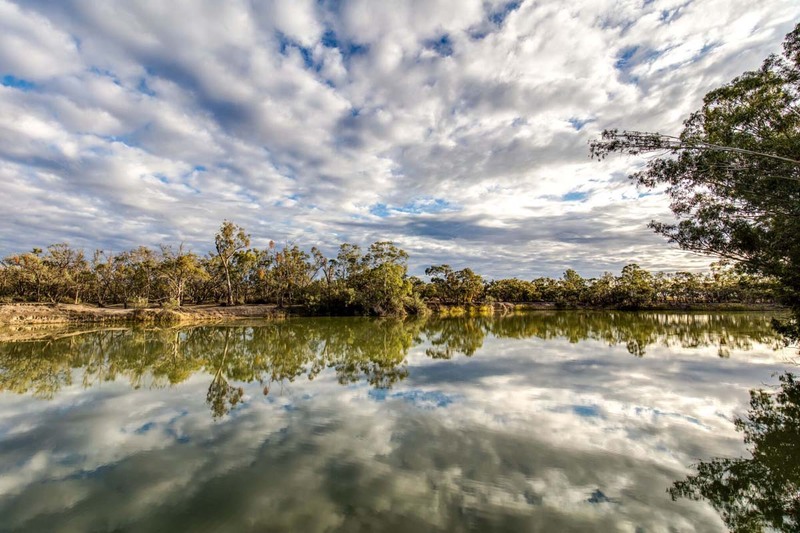 Explore Australia’s greatest river, The Murray, within the internationally recognised Riverland Ramsar Wetland in South Australia. Guided easy walking combined with peaceful cruising immerses you in the landscape and reveals the pioneering history of paddle steamers and a new environmental stewardship. 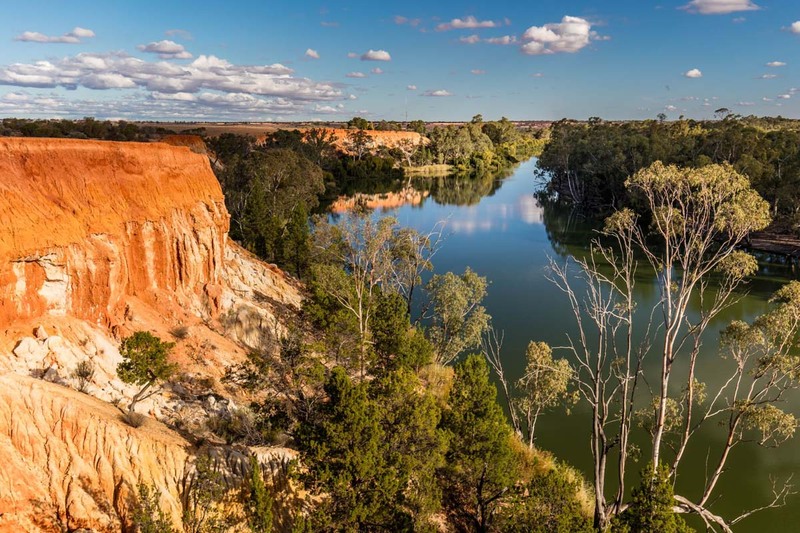 Encounter diverse wildlife and waterbirds along the Murray River, creeks and old oxbow lagoons that meander through ancient red gum forests dwarfed by spectacular red ochre coloured cliffs. Enjoy a pre-breakfast sunrise hike along the cliffs on one morning to start your day. The daily walking routes are on private property and conservancy areas with exclusive access for walk guests only. 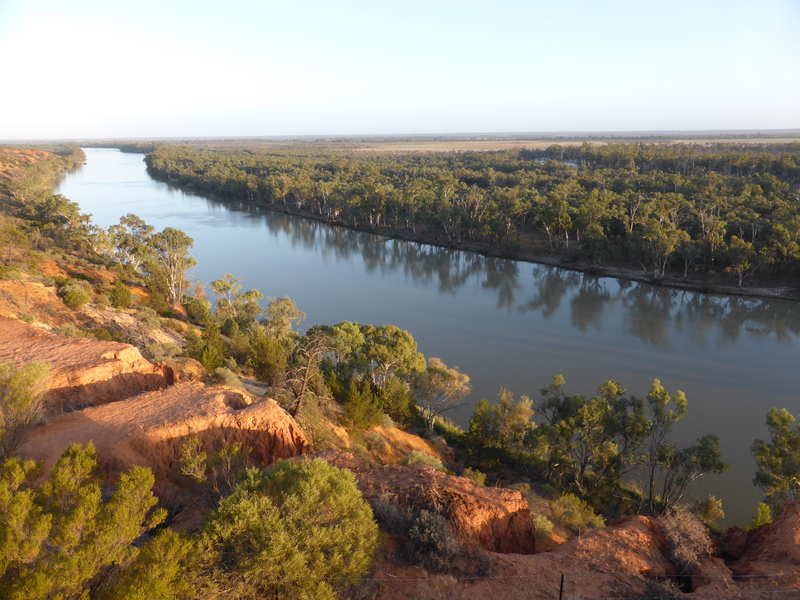 Murray River Walk is an easy 40km walk over primarily flat ground, ranging from 10-15km per day. This walk offers a unique opportunity for a mix of walking and river cruising, making it the perfect choice for people who are new to multiday walk style holidays. Spend three nights on a modern houseboat that cruises to your daily walking destination, complete with hot shower and top deck spa overlooking the river. Savour three course dinners each night created from local food and wine showcasing the produce of the Riverland food bowl. Celebrate your journey with a tour and lunch at the award winning Wilkadene Woolshed Brewery. We walk in the cooler months to ensure you have a truly enjoyable experience. The walk operates between May and September each year to capture autumn, winter and spring weather. 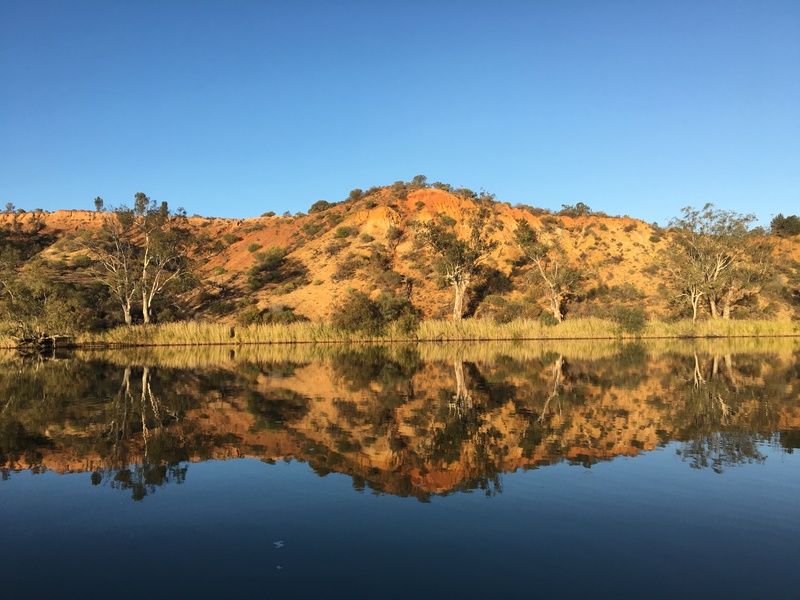 May and September are slightly warmer months than June, July and August, however, winter days in South Australia’s Riverland region are typically sunny. Each night you stay aboard a modern comfortable 10 berth houseboat with your own double room, plus hot showers and a hot spa on the top deck. All linen is provided including a bath towel. Leave your belongings in your room each day as the houseboat will travel to your daily walking destination. Dine aboard the houseboat on superb local menu designed by our consultant chef, renowned native food pioneer Andrew Fielke. Regional Riverland food bowl products are showcased where possible. Accommodation on nights 1, 2 and 3 on a modern comfortable 10 berth (5 room) houseboat. A 34L Day Pack with good waist support and a one-litre drinking water bottle. Plenty of room in your daypack for your camera, extra walking clothes, lunch and snacks. All food and beverages including a three-course meal each night, breakfasts, lunches and snacks (we cater for special dietary preferences based on your advice at the time of booking). Our guides carry first aid kits, UHF Radios and a satellite phone. Mobile phone reception is poor (time to disconnect!) although they can be charged on the houseboat for photos. Comfortable hiking boots or hiking shoes. We highly recommend beanies, scarves and gloves for morning warmth and long walking trousers. Thermal base layers and polar fleece tops are essential and can be easily stored in your day packs as the day warms up. Select your clothing based on winter daily maximums between 12 – 18 degrees Celsius. Riverland winters are relatively dry however a rain jacket is essential to carry and will protect you from the wind when cruising. A camera is recommended to capture this wonderful walking experience! Am I fit enough? You should aim to be moderately fit by being able to walk 10km comfortably at one time at least two weeks before you walk with us. A regular 5km walk is good preparation. You will carry on average 5kg each day in your day pack. Our walking pace is designed for complete enjoyment of the landscape, its wildlife and its beauty, and the people you are walking with. It is a slow walk (along a slow flowing river) – not a race. We have the flexibility for accommodating less mobile guests so they can still travel and enjoy the experience with a more mobile partner. Guests with prior injuries can relax on the houseboat for all or part of the trip if needed. 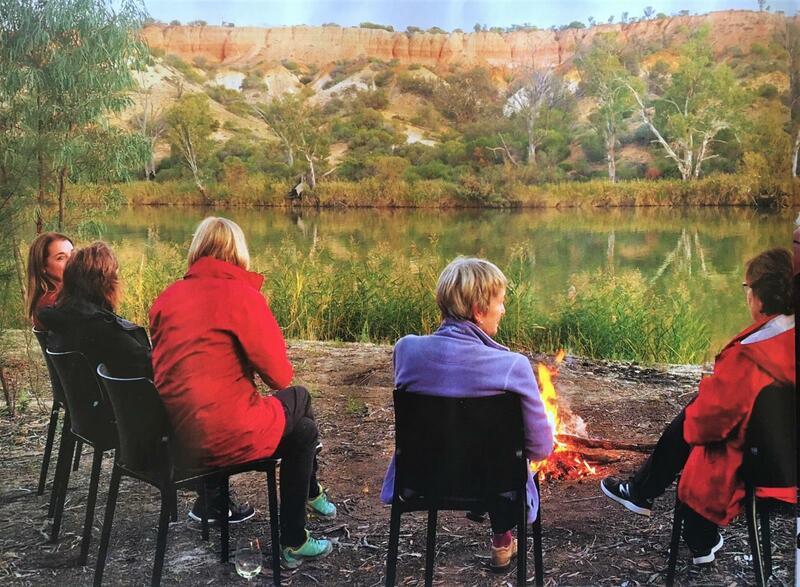 Murray River Walk will help you discover a rich river heritage including Aboriginal culture, pastoralism and the paddle-steamers, locks and weirs and river regulation, irrigation development and environmental stewardship, in a region that has become the fruit and food bowl of South Australia. 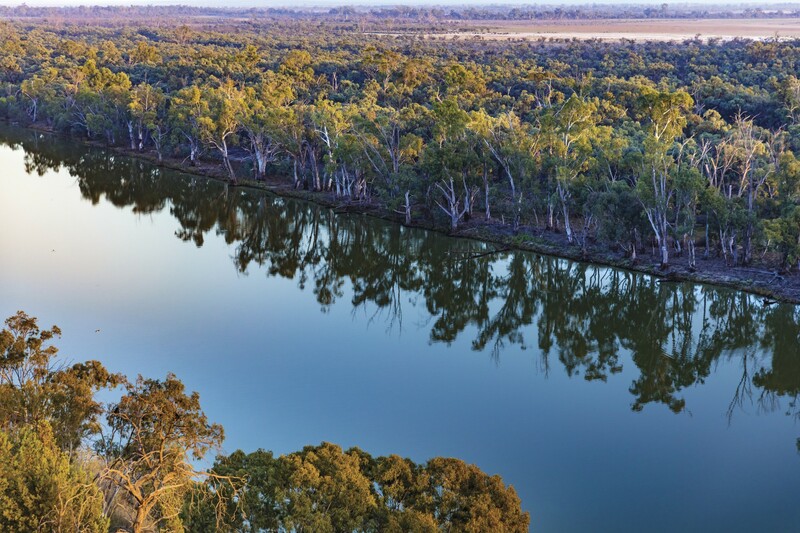 The Murray River drains 1/7 the area of Australia and flows over 2000 km to reach the Riverland at Renmark.More than a million people live in its catchment area which covers parts of 4 states and the Australian Capital Territory. It starts as a fast flowing stream in the Australian Alps and changes to a broad and meandering river through South Australia. 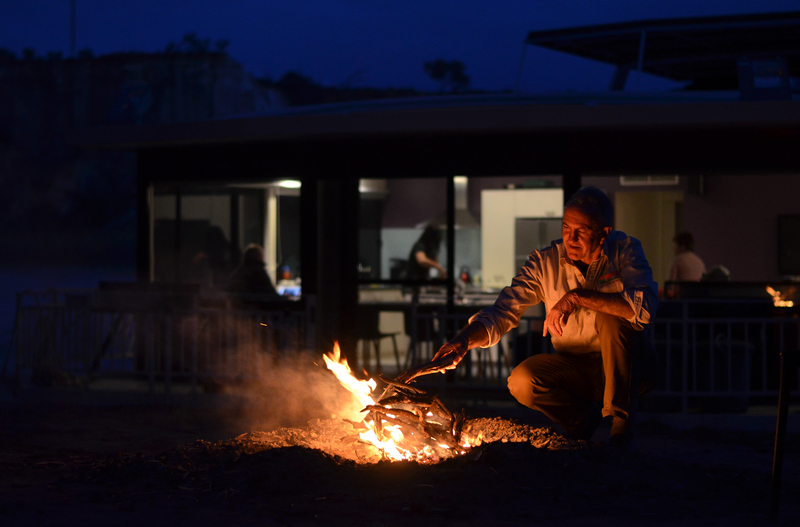 It is a food bowl, a playground, a wildlife sanctuary and Australia’s most studied river. Guides look forward to sharing its stories with you. Murray River Walk is entirely within the internationally significant Riverland Ramsar Site. In 1987 the Ramsar Bureau listed the Riverland Ramsar Site in recognition of its internationally significant wetlands and wildlife. 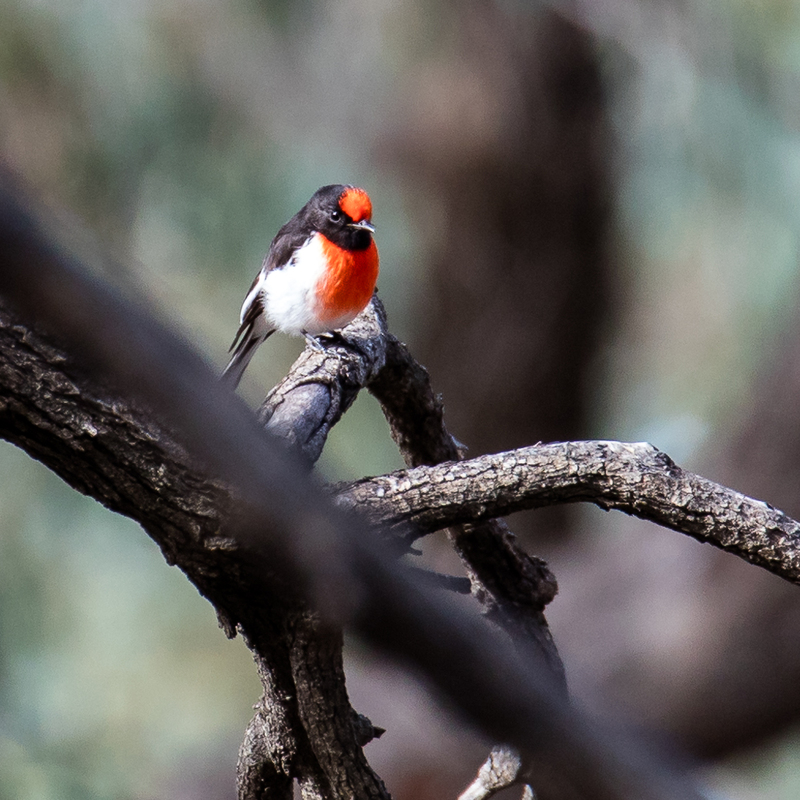 Red Gum forests are a feature and four nationally threatened species are recognised in its plan of management including the Regent parrot, Southern bell frog and two fish species – Murray Cod and Murray Hardyhead. 197 bird species and 19 species of mammal including 8 bat species occur in the area. In 1961 the first houseboat on the Murray River was built and launched at Renmark. 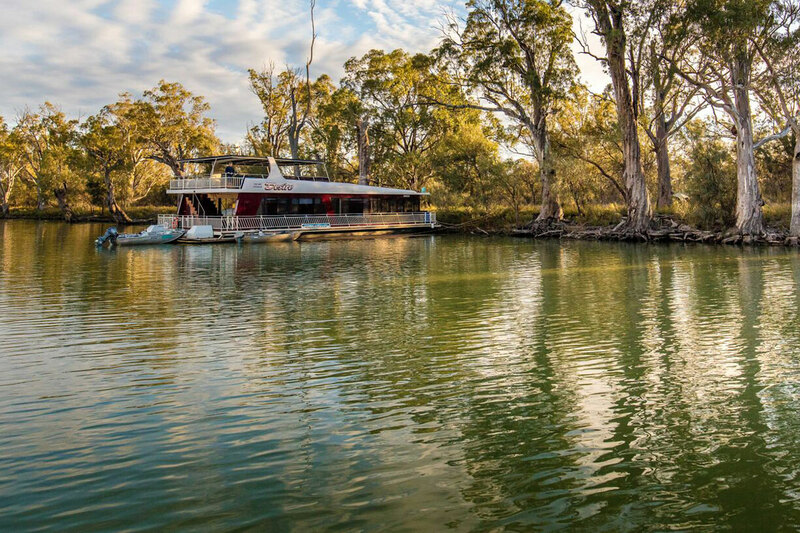 Murray River Walk is based on a houseboat that is part of a modern fleet of boats owned and managed by Rob and Jenna Hughes of River Murray Houseboats. All water transfers between the walking route and the houseboat are on a 12 seater “open air” catamaran cruiser. A stable and secure craft, your guides will expertly navigate through more than 70km of our spectacular waterways. 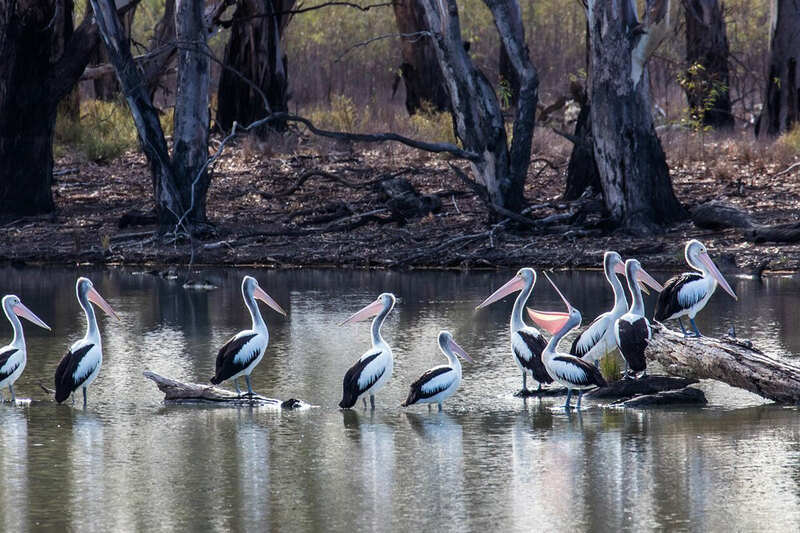 The Riverland Ramsar Wetland has many stories worth sharing. 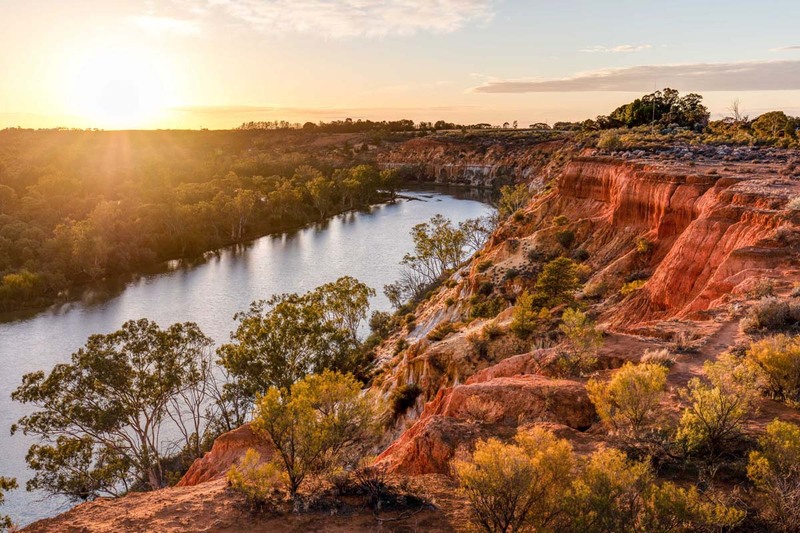 Our goal is to broaden the economic diversity of the Riverland region and South Australia by strengthening our regional brand and creating greater pride in our regional assets, so that our community is more resilient when future challenges arise. The walk has a strong focus on environmental stewardship and raising awareness with guests of the challenges of managing such a complex environment. 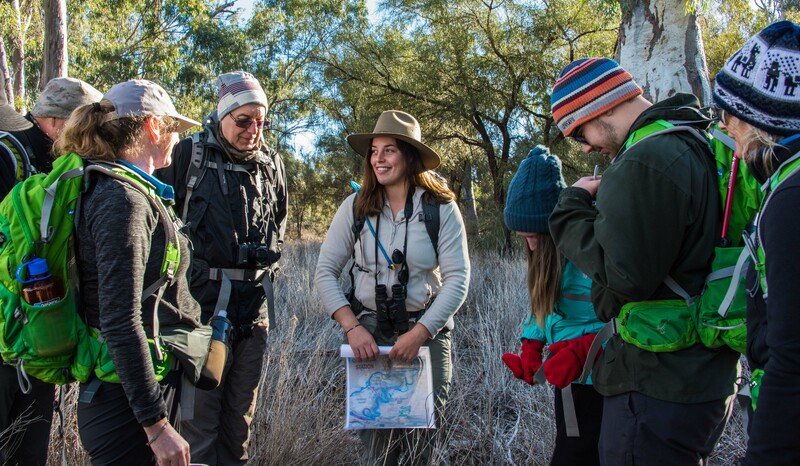 Providing rich informational content regarding the Murray Darling Basin and management of the Murray River to balance demands on water from industry and the environment, the walk includes interpretive tools such as maps of the basin and environmental watering. 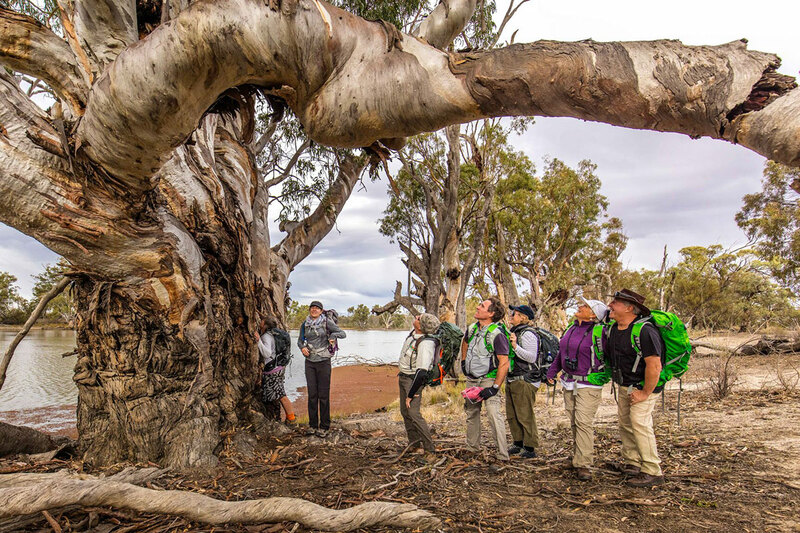 This walk is about sustainable tourism along the Murray River. 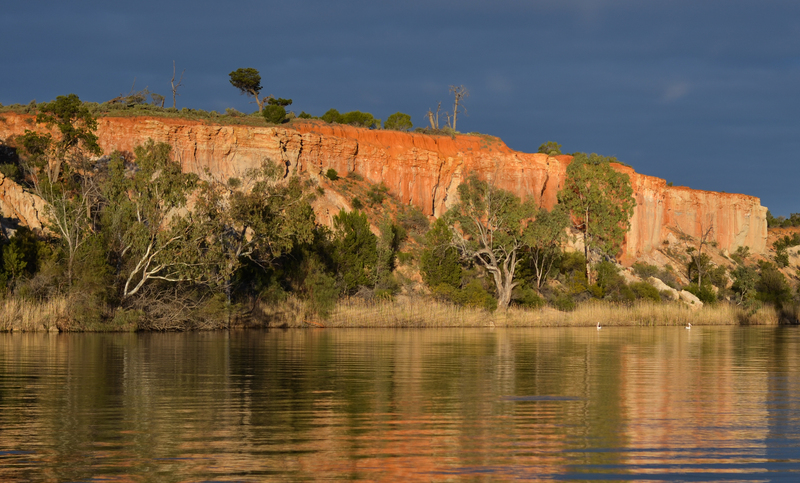 Enjoy beautiful cliff scenery in South Australia on the Murray River Walk. Take in stunning views of Headings Cliff on the Murrary River Walk in South Australia. 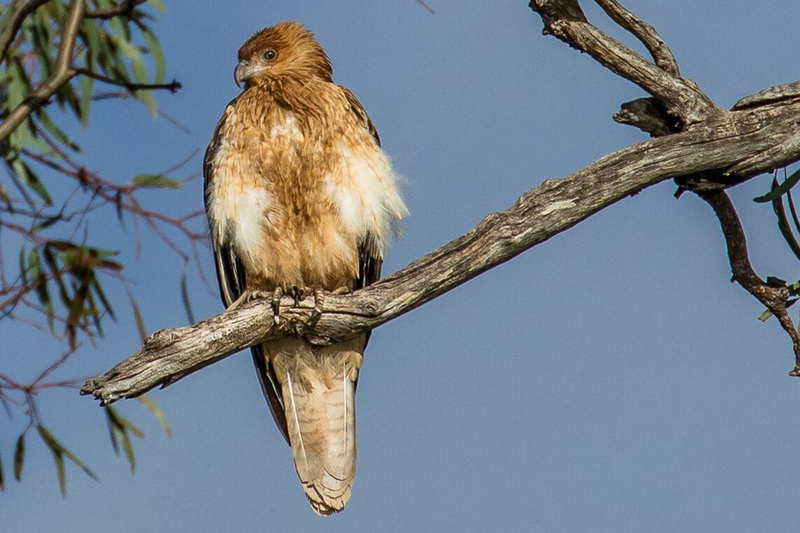 See Whistling Kites at Chowilla Creek with Great Walks of Australia on the Murray River Walk. Enjoy the sunrise over the Murray River Valley at Headings Cliff in South Australia. Walk as the sun rises to Headings Cliff on the Murray River Walk in South Australia. 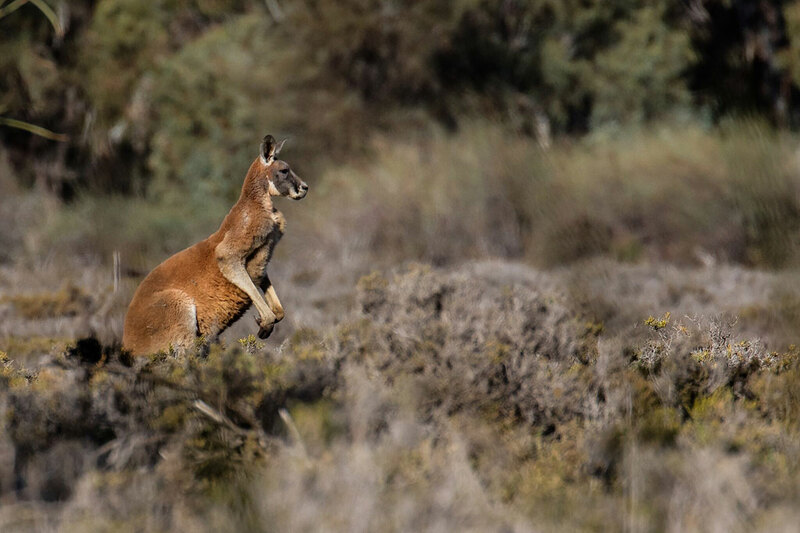 See kangaroos at Bulyong Island on the Murray River Walk in South Australia. Encounter unique Australian Wildlife at Queens Bend Clliffs on the Murray River Walk. Discover Horseshoe Lagoon with Great Walks of Australia on the Murray River Walk in South Australia. 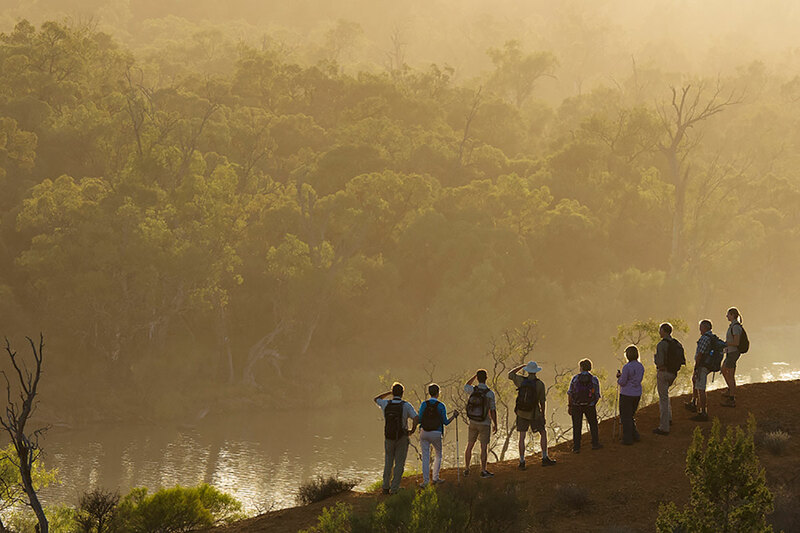 Discover unique Australian landscapes with Great Walks of Australia on the Murray River Walk, South Australia. 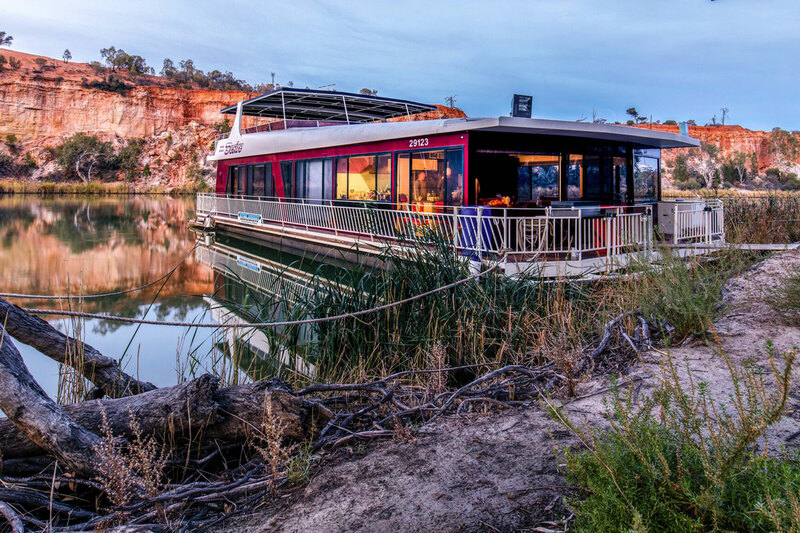 Stay on a modern and comfortable houseboat on the Murray River in South Australia. 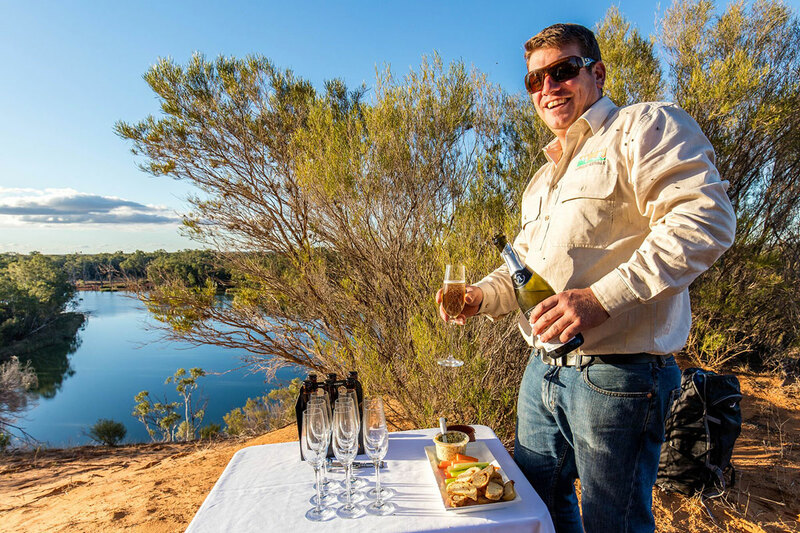 Enjoy Champagne by the river on the Murray River Walk in South Australia. Walk to Chowilla Creek on the Murray River Walk with Great Walks of Australia in South Australia. I am home now but can’t stop thinking about what I have just experienced. The Murray River Walk is world class, and Tony’s knowledge of the Riverland wetlands is unmatched. Having an Environmental Scientist as a tour guide on a luxury walk was extraordinary. This graph loosely depicts the gradient of the track, providing you with some basic understanding of how challenging the walk will be. The graphs are useful in helping you decide which walk suits you best. 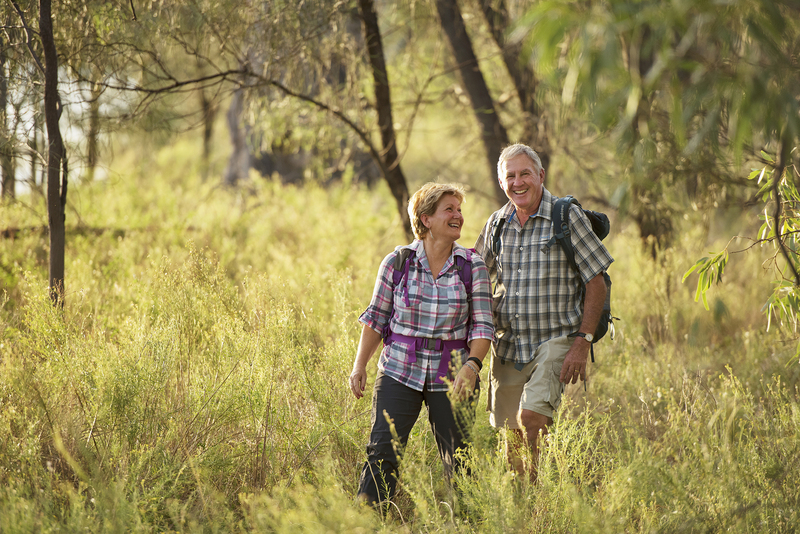 Whatever your ability or fitness, there’s sure to be a walk that suits in the Great Walks of Australia collection. * Elevations are indicative only and are not to scale. Walkers should contact individual walk companies to better understand the terrain and difficulty of each walk. Day One Distance - 14km walking and 15km cruising. 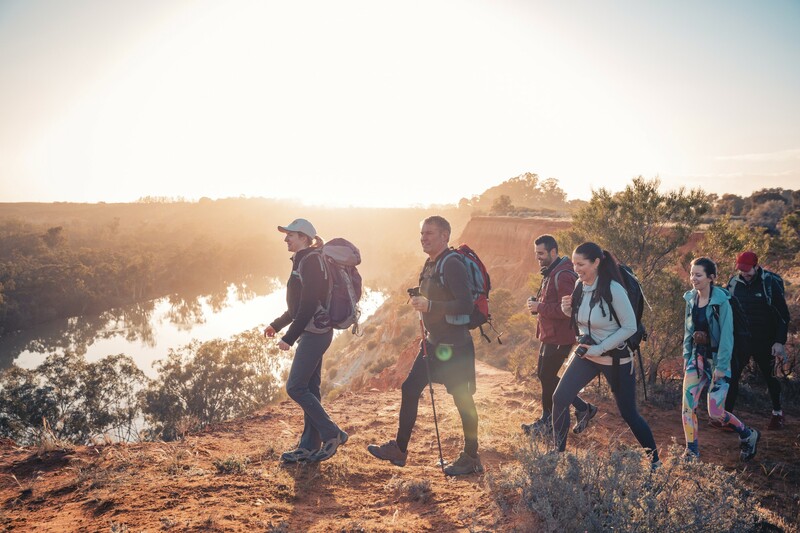 After meeting at the Renmark Hotel, walkers will board the "creek cruiser" for a 15km adventure through the Ral Ral and Bulyong Creeks to our morning tea location and the start of the walk. 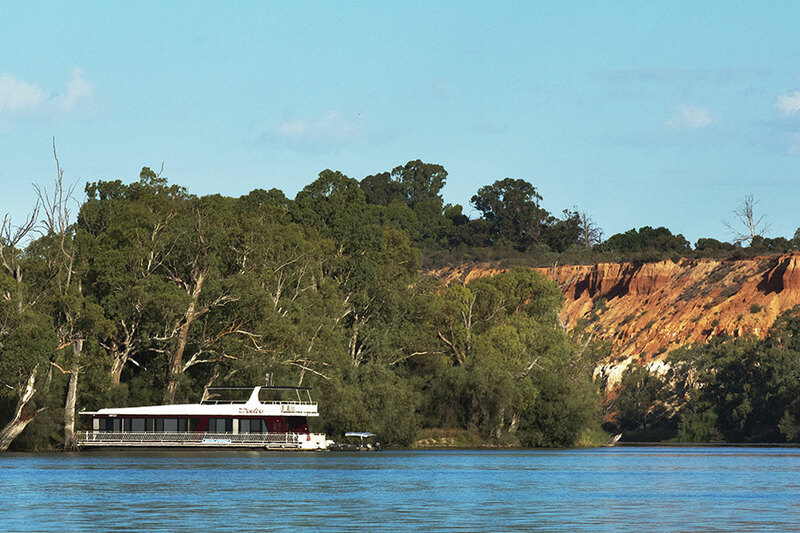 Our destination today is spectacular Headings Cliffs on the Murray River where your houseboat accommodation is moored. Traverse Reny Island through red gum forest and black box woodlands to the Ral Ral Creek Widewaters for lunch. Follow Argo Creek to the Murray River and discover the wreck of the P.S.Kelvin barge. Day Two Distance - 14km walking and 5km cruising. Our destination is opposite the historic Chowilla Station shearing shed on the banks of the Murray River. 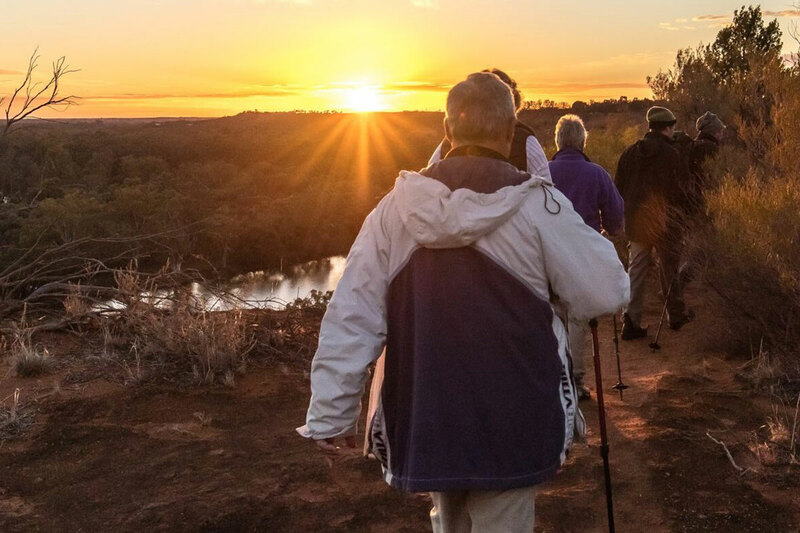 We arise early for a gentle climb up Headings Cliffs for a magnificent sunrise over the Murray River. Marvel at the geological layers in the cliffs formed by wind, oceans and freshwater lakes. After sunrise, we descend for breakfast aboard the houseboat. Departing for our daily walk, we follow an ancient river oxbow to the present Murray River corridor for morning tea. Explore dense red gum forest on the way to lunch on the river bank, then follow the Amazon Creek through Little Hunchee Island before meeting the creek cruiser which takes us back to the houseboat. Day Three Distance - 10-12km walking, 5km cruising. Our destination is majestic Queens Bend cliffs above Lock 6. We cruise via Chowilla Creek Environmental Regulator before arriving at Bunyip Reach to start our walk. Follow the meandering Murray River to the base of Lock 6 and its modern fish ladder for morning tea. 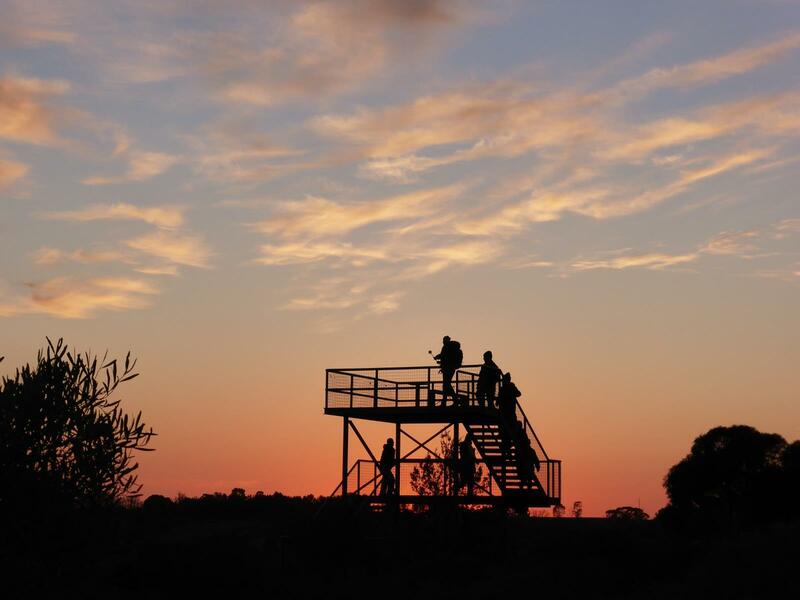 Explore the rejuvenated wetlands and water management structures on Bunyip Reach. After lunch we follow the rim of the valley to the historic site of the proposed 1960’s Chowilla Dam scheme before winding our way along the cliffs to Queens Bend lookout to celebrate a 40km journey. Day Four Distance - 35km cruising aboard the houseboat. 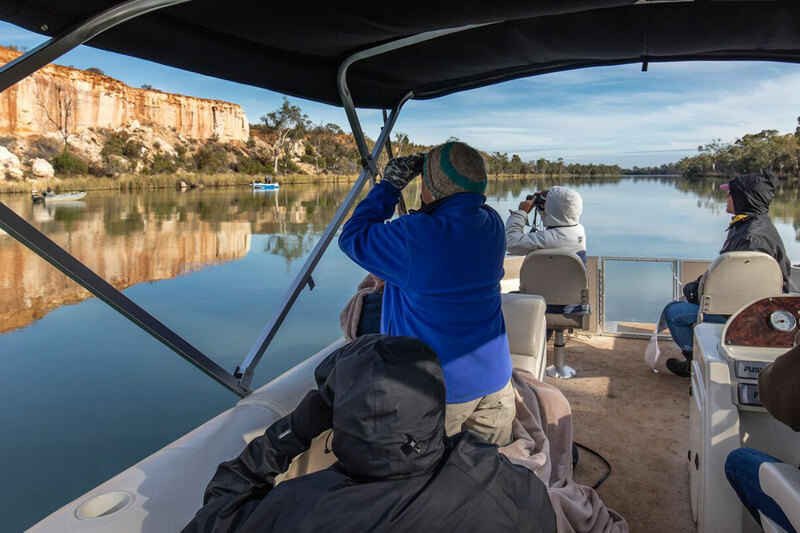 After breakfast, guests enjoy a morning of boat cruising and exploring the Mighty Murray River. Walkers then arrive at Wilkadene Woolshed Brewery for lunch, tour and a brew. Returning to Renmark by 2pm.